Reading and share top 18 famous quotes and sayings about Greatest Moments by famous authors and people. 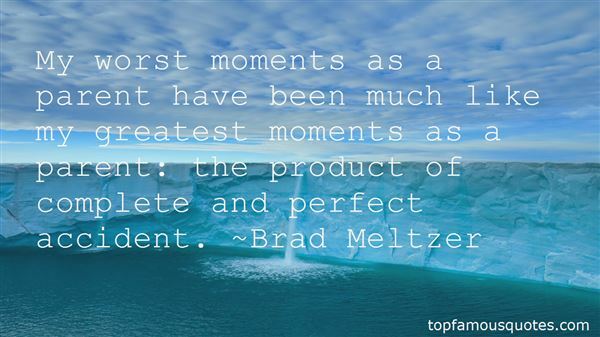 Browse top 18 famous quotes and sayings about Greatest Moments by most favorite authors. 1. "It had been a damned nice thing - the nearest run thing you ever saw in your life. (Waterloo 18 June 1815)'I hope to God,' he said one day,'that I have fought my last battle.It is a bad thing to be always fighting.While in the thick of it,I am much too occupied to feel anything;but it is wretched just after.It is quite impossible to think of glory.Both mind and feeling are exhausted.I am wretched even at the moment of victory,and I always say that next to a battle lost, the greatest misery is a battle gained.Not only do you lose those dear friends with whom you have been living,but you are forced to leave the wounded behind you.To be sure one tries to do the best for them,but how little that is!At such moments every feeling in your breast is deadened.I am now just beginning to retain my natural spirits,but I never wish for any more fighting." 2. "My worst moments as a parent have been much like my greatest moments as a parent: the product of complete and perfect accident." 3. "Man is not a 'fixed and limited animal whose nature is absolutely constant'. He changed drastically when he developed 'divided consciousness' to cope with complexities of civilisation, and has been changing steadily ever since. His greatest problem, the problem that has caused most of his agonies and miseries, has been his attempt to compensate for the narrowing of cinsciousness and the entrapment in the left-brain ego. His favorite method of compensation has been to seek out excitement. He feels most free in moments of conquest; so for the past three thousand years or so, most of the greatest man have led armies into their neighbours' territority, and turned order into chaos. This has plainly been a retrogressive step; the evolutionary urge has been defeating its own purpose." 4. "It's like he has these moments where he just captures me in his snare and I can't see around me. Tunnel vision. I'll call it the Ian tunnel effect since it hinders me at the greatest of moments when I should be focused elsewhere." 5. "Our greatest mistakes, if we look at them, and digest them, and interact with them, and learn from them… they can be the greatest moments of our lives." 6. "It was strange, I reflected.. that even in the weirdest circumstances, the most troubling episodes of one's life, the greatest divides from home and familiarity, there were these moments of undeniable joy." 7. "Perhaps the two greatest moments of my life were standing on the moon and being outside of the room when my granddaughter was born! We tend not to remember the worst." 8. "The Hour-Hand of Life --- Life consists of rare, isolated moments of the greatest significance, and of innumerably many intervals, during which at best the silhouettes of those moments hover about us. Love, springtime, every beautiful melody, mountains, the moon, the sea – all these speak completely to the heart but once, if in fact they ever do get a chance to speak completely. For many men do not have those moments at all, and are themselves intervals and intermissions in the symphony of real life." 9. "In all human love it must be realized that every man promises a woman, and every woman promises a man that which only God alone can give, namely, perfect happiness. 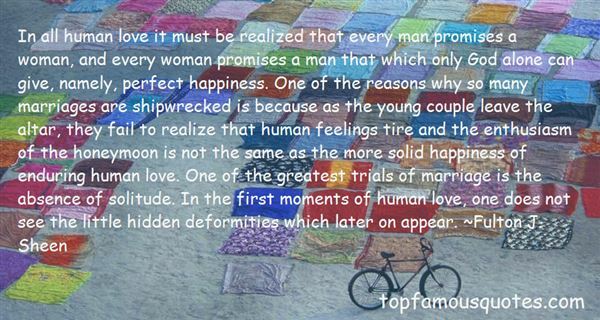 One of the reasons why so many marriages are shipwrecked is because as the young couple leave the altar, they fail to realize that human feelings tire and the enthusiasm of the honeymoon is not the same as the more solid happiness of enduring human love. One of the greatest trials of marriage is the absence of solitude. In the first moments of human love, one does not see the little hidden deformities which later on appear." 10. "I am a wicked man... But do you know, gentlemen, what was the main point about my wickedness? The whole thing, precisely was, the greatest nastiness precisely lay in my being shamefully conscious every moment, even in moments of the greatest bile, that I was not only not a wicked man but was not even an embittered man, that I was simply frightening sparrows in vain, and pleasing myself with it." 11. "If basketball was going to enable Bradley to make friends, to prove that a banker's son is as good as the next fellow, to prove that he could do without being the greatest-end-ever at Missouri, to prove that he was not chicken, and to live up to his mother's championship standards, and if he was going to have some moments left over to savor his delight in the game, he obviously needed considerable practice, so he borrowed keys to the gym and set a schedule for himself that he adhereded to for four full years—in the school year, three and a half hours every day after school, nine to five on Saturday, one-thirty to five on Sunday, and, in the summer, about three hours a day." 12. "I still say one of the greatest moments in my whole NBA career was getting drafted." 13. "My stage successes have provided me with the greatest moments outside myself, my film successes the best moments, professionally, within myself." 14. "The process of dying is a difficult one, with many fears and anxieties, but it is also a very mysterious and wondrous process. It involves both the body and the soul in the greatest transition we are ever called to make. When I sit vigil with those who are at the edge of death, moments away from crossing over, I am constantly in awe of the process happening in front of me, one that each one of us must eventually go through." 15. "Cool morning shadows sadly shift across the floorEach time we say goodbye it's harder than beforeEven after all the pain of parting still we findThat we must mourn the death of the dreams we leave behindAs I turn my back on all that means the most to meThe sounds and smells, the light that dances on the seaThe greatest gamble is to act on the beliefThat only the slave who leaves it all is truly freeThe sacrifice that we both lay before His feetA thousand moments that belonged to usThat now will never beBy faith we hold a better dream inside our heartsA time when our family will never have to be apartTill then we struggle with just what it really meansAnd we will mourn the death of our beautiful dreamsMourn the death of our beautiful dreams"
16. "The fates have a way of demanding of a man that he suffer his greatest moments all by himself; being alone seems as often attendant upon reality as being in company is attendant upon flight from reality. (frm "Part of Our Time, Some Monuments and Ruins of the Thirties," about American Communist movement.)" 17. "Your truest friends are the ones who will stand by you in your darkest moments--because they're willing to brave the shadows with you--and in your greatest moments--because they're not afraid to let you shine." 18. "Change will force you to step off the path, to venture from the nest, to close your eyes and dive right in, knowing that the greatest opportunities in life are found in the sink or swim, do or die moments." You are so weird sometimes."